With roughly two weeks left until Solo: A Star Wars Story debuts in theaters, new details have surfaced about how much of the finished film director Ron Howard actually shot, after replacing ousted directors Phil Lord and Chris Miller. While this report has not yet been confirmed, sources close to the production who have seen the finished film estimate that roughly 70% of the movie was shot by Ron Howard. Here's an excerpt from this report below, revealing how Kathleen Kennedy had brought on Ron Howard, 'within days' of firing Lord and Miller. "Within days, Ms. Kennedy hired Mr. Howard, who like her and Mr. Kasdan rose to filmmaking fame in the 1980s and '90s while Miller and Lord were children. 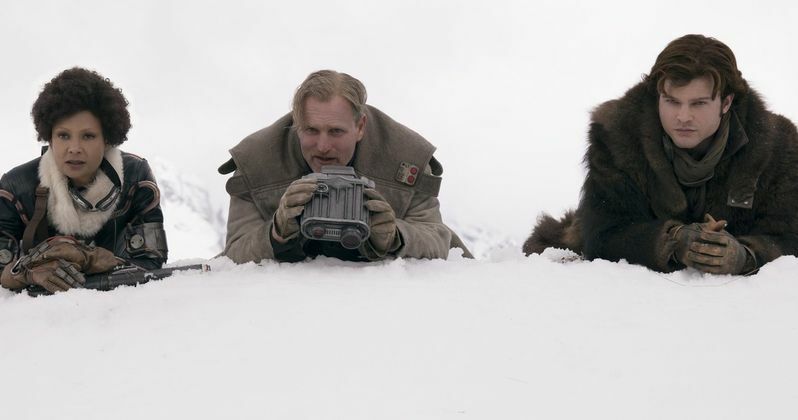 Mr. Howard worked faster than his predecessors, sometimes reshooting scenes in a few hours that Lord and Miller spent a whole day on, one of the Solo actors said. About 70% of the finished movie came from scenes Mr. Howard shot, another person close to the production said." When Lord and Miller were fired in late June 2017, the filmmakers had been in production for four months, with another month left to shoot, but when they were fired. Howard came aboard and continued the shoot until mid-October, going far beyond the month of scheduled filming left and the other weeks of reshoots already built into the schedule. Still, there had been no indication, as to how much of the finished movie would be the work of Ron Howard, until now. Here's what another source had to say, which illustrates how far apart Howard's approach was to Lord and Miller's. "Ron wanted to go back to the spirit of the Original Trilogy, while Phil and Chris were looking forward to something new, more like Guardians of the Galaxy." As for what was kept from Lord and Miller and what was scrapped, we may never know. Paul Bettany, who plays Dryden Vos, and was brought on by Howard after he took over, claimed in an interview that Howard re-shot much more than he originally intended to, while Thandie Newton stated that over 90% of her scenes were actually directed by Lord and Miller. Regardless, the former directors ultimately decided not to even contest their directorial credit, with Ron Howard getting full directing credit. The report revealed that, last winter, LucasFilm screened a cut of Solo: A Star Wars Story for Phil Lord and Chris Miller, so they could determine whether or not they wanted to fight to get their director's credit with the Director's Guild of America. Ultimately, the filmmakers didn't fight for the credit, and wound up with executive producer credits, "in light of the creative differences" between the directors and LucasFilm. Regardless of all the behind-the-scenes drama, Solo: A Star Wars Story has been tracking quite well, with the latest projections putting Solo: A Star Wars Story at over $170 million through the four-day holiday weekend, which would break the all-time record for that holiday weekend. You can head over to the Wall Street Journal to read their extensive report on the production.